Download the ebook from Amazon to your smartphone, tablet, laptop, Mac, PC or Kindle. Get the ebook from Amazon for your smartphone, tablet, laptop, PC or Kindle. Ophelia is left with “self-slaughter” (1.2) as her only route of escape when her sanity is overwhelmed by Hamlet the play’s maddening world of deception and betrayal. Introduction: (“I cannot choose but weep”) Ophelia’s breakdown results from her exploitation by everyone around her for their own purposes. Sister and daughter: (“A green girl”) Her brother Laertes warns her against her relationship with Prince Hamlet; her father Polonius ends it. Seductress and spy: (“Where is thy father?”) At her father and the king’s bidding, Ophelia attempts to trap Hamlet into revealing his past love for her. Trauma and truth-telling: (“Pray you, mark”) No longer silenced, Ophelia uses the language of flowers to speak the truth about the Danish court. Ophelia’s death: (“Fell into the weeping brook”) The passivity that so characterized her life becomes the cause of Ophelia’s despairing death. Conclusion: (“A living monument”) Ophelia’s burial is overshadowed by two male characters who fight over who loved her more. 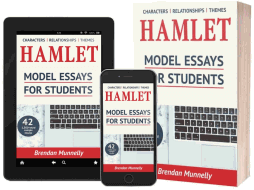 42 x 1,500-word sample essays on the main characters, relationships, and themes of Shakespeare’s Hamlet. Ophelia in Hamlet does not share the leading role occupied by the female title characters in other Shakespearean dramas such as Romeo and Juliet and Anthony and Cleopatra. But her character illustrates one of the play’s central themes: the collapse of sanity that results from living in a maddening world of deception and betrayal. Ophelia’s submission to her manipulative father Polonius, who in turns serves the corrupt King Claudius, in the end crushes her sanity (“a document in madness”, 4.7) and leaves her with only one route of escape: death. Over time, Ophelia has become an iconic representation of every powerless and voiceless young woman who is divided between her true self and the role she has been forced to play in order to conform to social expectations. In #Hamlet, #Ophelia is manipulated by everyone around her for their own selfish purposes. Ophelia is exploited by everyone around her for their own purposes. Her father Polonius uses her to gain favor with King Claudius (“I hold my duty as I hold my soul, / Both to my God and to my gracious king”, 2.2). Claudius uses her to uncover the source of Hamlet’s ‘antic disposition’ (“If ’t be the affliction of his love or no / That thus he suffers for”, 3.1);. Prince Hamlet uses her to pretend that his feigned madness is caused by unrequited love (“Here's metal more attractive”, 3.2). Her name means ‘helper’, but, in the end, Ophelia could not even save herself. quotations from the play to support your statements. The Ophelia we first meet in 1.3 has not yet had her spirit crushed by the world of Elsinore. In her conversation with a Paris-bound Laertes, her responses of “Do you doubt that?” and “No more but so?” suggest agreement with her brother’s warnings about Prince Hamlet. Yet her words also display a certain amusement at her brother’s sermonizing and a worldly awareness of male hypocrisy. She gently implores him not emulate those “ungracious pastors” who neglect to practice what they preach. Ophelia’s teasing wordplay with Laertes in 1.3 echoes the pun-loving eloquence of Prince #Hamlet. Ophelia’s gentle ripostes to her brother mirror the eloquence of the scholarly and pun-loving Prince Hamlet. Is it only obedience to her father that motivates Ophelia to collude in the “’twere by accident” (3.1) scheme to “sift” (2.2) Hamlet in the so-called ‘nunnery scene’ of 3.1? Or, by encouraging the prince to recall his past love for her (“words of so sweet breath composed”), does she hope also to rekindle it? A suspicious (“Where is thy father?”) and then hostile prince responds with an abusive and self-contradictory rant—against women, men and himself. At the end, Ophelia is abandoned alone on stage, humiliated and holding the “remembrances” she intended to return to Hamlet. Afterward, the “of ladies most deject and wretched” Ophelia will succumb to the madness she mistakenly believed the denial of her love caused in Hamlet. Ophelia tries and fails to trap Prince #Hamlet into revealing his past love for her. Polonius offers Ophelia as bait (“I’ll loose my daughter to him”, 2.2) in his scheme to uncover the cause of Hamlet’s antic behavior (“the root of his defect”, 2.2). Polonius’ motive is entirely selfish: he wishes to prove his loyalty to King Claudius. When they emerge from their hiding place to debate the meaning of Hamlet’s responses, neither Polonius or Claudius ask for Ophelia’s opinion. Her father and the king claim to “have heard it all” (3.1), but each comes to a different conclusion. Claudius knows what Polonius does not, and must hear Hamlet’s remark about “all but one shall live” (3.1) as a direct threat. Through fragments of traditional songs, but more vividly through the symbolic language of flowers, in 4.5 the traumatized Ophelia expresses her clear recognition of the dark truths beneath the surface of the Danish court. Her distribution of flowers conveys very specific accusations voiced in a mood of deep grief that will shortly descend into despair and apparent “self-slaughter” (1.2). So often dismissed by others, Ophelia now dismisses the king’s suggestion that her grief arises solely from Polonius’ death. Through the ballad of a naive girl who is seduced by the promise of marriage only to be abandoned because she is no longer a virgin, Ophelia conveys the maddening contradictions of her situation and impossibility of anything but failure: “I cannot choose but weep” (4.7). In #Hamlet, everyone to whom Ophelia hands out flowers, including herself, will shortly die. To the king, Ophelia presents fennel (representing flattery) and then columbines (adultery). To the queen and herself, she offers rue (sorrow and regret). Ophelia adds that Gertrude must wear her rue differently: as “‘herb of grace’ o’ Sundays”, which carries the extra connotation of repentance-seeking for past sins. Ophelia picks up a daisy, only to put it down again; the innocence and gentleness it represents have no place in what Hamlet called the “unweeded garden” (1.2) at Elsinore. With its recurring motifs of death and burial, Ophelia’s ‘mad scene’ serves as a warning of impending doom: everyone to whom she hands out flowers, including herself, will shortly die. Ophelia’s death: accident, suicide, murder? Although her final act takes place offstage, the image of a drowning Ophelia ranks alongside Hamlet’s graveside cherishing of Yorick’s skull as one of the play’s most enduring and iconic images. As poetically recounted to Claudius and Laertes by Queen Gertrude in 4.7, she created a crown of flowers and weeds and climbed a riverside willow, a tree associated with unrequited love. The passivity that characterized #Ophelia's life becomes the cause of her despairing death. The brook-side tree Ophelia attempted to climb was a willow, which is associated with sadness and lost love; its downcast, water-overhanging branches suggest tears and depression. In Ophelia’s hand was a coronet of wild flowers: crowflowers, (buttercups, suggesting ingratitude), nettles (sharp and stinging weeds), daisies (representing innocence) and long purples (orchids, representing sexual love). Why did Gertrude not at least try to intervene to prevent Ophelia’s death? Did she view a possibly pregnant Ophelia (“I hope all will be well. We must be patient”, 4.5) a threat to her position as queen? Ophelia’s death combines elements of an accident and suicide. Hence her burial in a church graveyard but without the full rites granted to “peace-parted souls” (5.1). Ending her life was only power left to Ophelia, her only escape from the control of others. In a way, her “self-slaughter” and “melt(ing) into a dew” (1.2) is Ophelia’s revenge. Her death also leads to Hamlet’s, for it is at her grave that the prince challenges Laertes: “I will fight … upon this theme” (5.1). But in so doing, she also helps the prince achieve his goal of removing Claudius without himself becoming tainted by the motive of private vengeance. Horatio’s summary account to Fortinbras makes no mention of Ophelia. But she is present in the story that Shakespeare tells. It is her “living monument” (5.1). In #Hamlet, Ophelia's "self-slaughter" is her revenge against the Elsinore that silenced her. Claudius’ comment of “Poor Ophelia, divided from herself and her fair judgement”, 4.5) is echoed by the prince’s later claim to Laertes that “Hamlet from himself be ta’en away” (5.1). If only with “maimed rites”, Ophelia is buried in a Christian graveyard on the “great command” of the king and against the wishes of the “churlish priest” (5.1). In contrast, her “bonny sweet Robin” (4.5) is promised a ceremonial burial with full military honors by Fortinbras: “Let four captains / Bear Hamlet like a solider to the stage” (5.2). The most helpful book ever for students and teachers of Shakespeare’s Hamlet. 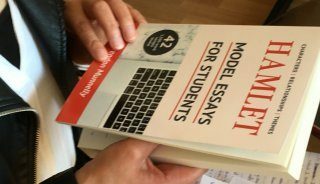 IN THIS BOOK ARE THREE 1,500-WORD SAMPLE ESSAYS ON EACH ONE OF THE FOLLOWING 14 CHARACTERS, RELATIONSHIPS, AND THEMES. THAT’S 42 SAMPLE ESSAYS IN TOTAL. Born a prince, parented by a jester, haunted by a ghost, destined to kill a king rather than become one, and remembered as the title character of a play he did not want to be in. His “ambition” for Denmark’s throne leads him to commit one murder only to find that he must plot a second to cover up the first. When this plan fails, his next scheme leads to the death of the woman he loves. “Have you eyes?”, Prince Hamlet demands of his mother. Gertrude‘s “o’erhasty marriage” dooms her life and the lives of everyone around her when her wished-for, happy-ever-after fairytale ends in a bloodbath. As she struggles to respond to the self-serving purposes of others, Ophelia’s sanity collapses in Elsinore’s “unweeded garden” of falsity and betrayal. Her “self-slaughter” is her revenge for her silencing and humiliation. By surrendering Denmark to his rival’s son, Hamlet grants to the angry Ghost of his “dear father murdered” the forgiveness his suffering soul needed more than the revenge he demanded. Uncle and nephew are two men at war with each other—and themselves. Claudius is haunted by the murder he has committed (“O heavy burden!”); Hamlet by the one he hasn’t yet (“Am I a coward?”). Gertrude’s marriage to Claudius and her collusion with the prince’s confinement at Elsinore creates a barrier between mother and son who are as different from one another as is humanly possible. Begins in uncertainty, descends into mutual deceit and rejection, and ends with their double surrender to death: she, to the water; he, to Claudius’ rigged fencing duel. “Those friends thou hast … Grapple them unto thy soul with hoops of steel.” Horatio is Hamlet’s trusted confidant in life and vows to remain the keeper of his memory after the prince’s death. A marriage of mutual self-interest. Claudius wanted something (the kingship) he did not have; Gertrude had something (the status of queen) she wanted to hold onto. A king murdered, an inheritance stolen, a family divided: Elsinore’s older generation destroys its younger when two brothers—one living, one undead—battle in a “cursed spite” over a crown and a queen. Hamlet and Laertes journey from revenge, through obsession and anger, to forgiveness. And the revenge sought by the Ghost on King Claudius becomes the revenge of Old King Fortinbras on Old King Hamlet. “Who’s there?” The characters struggle to distinguish between truth and falsehood in a play-long triple pun on the verb ‘to act’: to take action, to behave deceitfully, and to perform in theater. “Your noble son is mad”, Polonius tells Denmark’s king and queen. But is Hamlet ever really insane? If not, why is he pretending to be? And is the prince’s behavior the cause of Ophelia’s traumatic breakdown? MAIN IMAGE: Ophelia. An oil on canvas painting by John William Waterhouse (1894). From Wikipedia Commons. Starting points to express, in your individual writing style, your own interpretation of the play’s main characters, relationships and themes. 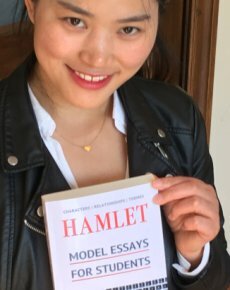 For students and teachers of Shakespeare’s Hamlet: 42 easy-to-read and written-to-inspire 1,500-word sample essays.